Here is my addition to Best Shot Monday over at Picture This! 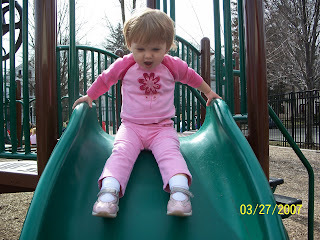 We had a nice warm day last week and headed to the playground with PopPop. I got a few pictures, but it's hard to keep up with my little monkey anymore. To get her to be still for a picture outdoors... well that a true rare occurence. I do like this picture though. Zoe's just getting so big.